A large number of apprentices taking Shannon Rogers' introductory course on hand tool use are coming to us with pretty much the same questions. Generally you are new to woodworking and don't know a lot about tools, and what to look for. At the same time, Shannon recommends you purchase a decent brace, and a 1/4 in, 3/4 in and 1 in bit. Addressing these requests gets a little more complicated than you might imagine, so we here at the Farm thought it might be a good idea to post this information sheet so you can get a better idea of what you are looking forward before investing and to know what we are offering. 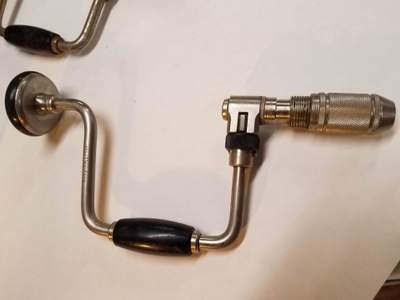 BRACES: Keep in mind that hand braces were the "cordless drill" as late as the 70's-80's. In fact, we've met cable installers who still keep them in their vans! New braces are available, but frankly, they are not the same quality as older professional models. We encourage people to look at Stanley and Millers Falls braces, because good ones can still be found. We also repair braces, so are able to purchase ‘rough' ones that can be stripped for parts. Keep in mind that repair parts for these old work horses are no longer made. All this being said, there are other very good braces still on the market. If you have a preference, you can certainly go with it, and if you would like us to find you a special old brace, we will do our best to do so. Specific braces come and go, so it is not possible to offer a general catalog of braces we have at any given time. Also, these are relatively complex tools. For these reasons we will be offering individual braces in the not too distant future. In the meantime, we can send you and information sheet that we update regularly that gives you an idea of what is currently on hand. NOTE: Our restoration shop is a one-man operation. At present there is no back log of restored braces on hand, but plenty in stock. Therefore, pictures shown at this time are of braces in their rough state. If you would like to see your brace prior to accepting it, we can send you pictures once it is ready to go. Generally we recommend a good professional grade brace. At the same time, some of these were over built, bulky and not really suitable for inside shop work. We have found from experience that the Stanley No. 923 and 945 models are ideal for the purpose. This is not only an example of the newer version of the No. 923, but the new Bell System-B is identical to this model. An older version of a No. 945 has been labeled to show the anatomy of a brace. Some folks have done some research and came across the Stanley 2101 "North Brothers" This is one of those over built braces I mentioned. They were made to be used outdoors in all conditions. As a result they often look terrible even though they work perfectly. It is also noted that they can be completely rebuilt. This is true, but only by trained technicians…...Yes, we can repair them. The bottom line here is that the North Brothers really far exceeds what the average woodworker needs. They are also getting hard to find, so we have to ask premium prices for good ones. This is the box and chuck to a No. 2101 "North Brothers" If you take this chuck and put it on the frame of the No. 923 pictured above, you have a Bell Systems-B. If you still must have a North Brothers, we'd suggest you look at the Bell Systems-B model. This uses the frame of a 923/945, with the North Brothers chuck. Another great brace in this category is the No. 813 with the Lion chuck, but these are a bit hard to find. Millers Falls made several braces using the Sampson chuck. These are on par with the 813. Also Craftsman offered these braces under their name and are great tools. Bottom line here; you are going to pay quite a bit for any one of these braces, but they will probably outlive your grand kids once we have restored them! At the other end of the scale we offer the Stanley 1253. This was also sold under a couple of other names, but all of them are identical. These were meant for amateur use, but are about the same quality level as what is being offered today. They are a bit lighter built than the old professional models, but still very adequate. 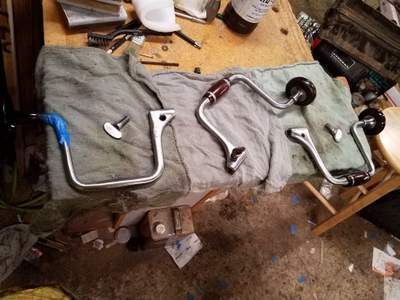 In fact, we recently helped a gentleman find parts for a thirty year old 1253 he has used regularly since he bought it new three decades ago! Generally we recommend a ten inch brace for starters. 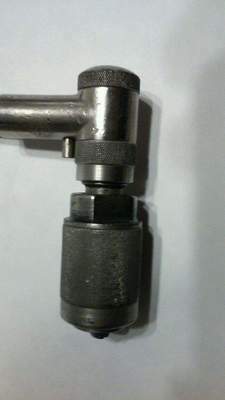 This refers to the measurement from the mid-line of the crank handle to the axis of the chuck and head. This measurement will be five inches on a ten inch brace, or the radius of the "swing". Larger swings will give you more leverage, but turn slower. These would be ideal for heavy work if you were doing it every day; for example, boring bench dog holes or timber framing as a living. Shorter swings not only allow you to crank the brace faster, but are often more convenient. Experienced woodworkers will often have a back up eight inch brace for running screws. Some time ago we supplied a gentlemen such a brace alone with screw driver bits which he used to take off the entire hull planking of his wooden yaught. The most common shorter swing brace is eight inches, but can go as short as six or even five inches. Fixed chucks have become popular. The most sought after is the Spoffard chuck. The common brand name here is Fray & Pigge or John Fray. This is a brace that should really be considered later on. They are simple to use, but you should know what your capabilities are before committing to one of these. They tend to be pricey due to their increasing rarity. Besides the Spoffard brace, there are several other styles, some of them quite elegant. We have a number of these on hand pending restoration. We are excited about offering them someday as they really are quite elegant. YOUR NEXT STEP: Now that you have a rough idea of what is available and what you are wanting, contact us and ask for the Hand Brace Information Page and we will send you the most current updated version. If you end up holding off for a while, you might want to request it again later on as we update it as new braces come in. Also, we are starting to post picture of what finished braces look like to give you a better idea of what you will be purchasing. 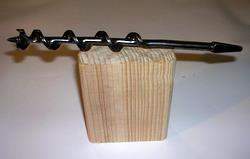 BITS; Double spiral auger bits, also called "Jennings bits" after their inventor, were made by stamping tool steel rod (AKA: Drill rod) flat to the diameter of the drill being made. Then it is twisted to form the double spirals and the pilot screw, flutes and lips are formed on the end. 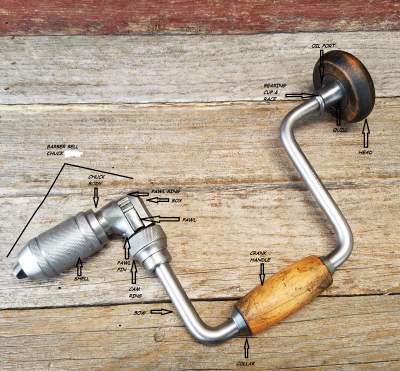 This simple technology enabled any well-equipped forge to mass produce drill bits. The trouble them starts with the steel. Usually this was a lesser quality, water tempered steel. Combined with the twisted design, this causes many of these bits to bend. Also they do not tend to hold edges well. There is also the problem of clogging between the close spirals when drilling a deep hole. At the Farm, we discourage the use of double spiraled bits to beginners for these reasons. 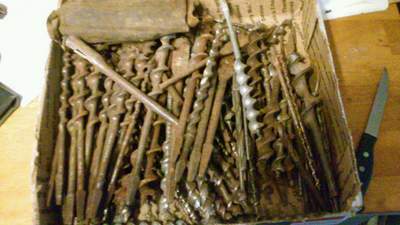 This is a selection of auger bits about to be sorted and stored. It gives you an idea of what we start with! Single spiraled bits, or Irwin bits, were made by machining a stiffer steel. The design allows for a center "spine", so this style of bit not only stays straighter, but holds an edge better. Single spiral bits are also much more available no days. INDIVIDUAL BITS VS SETS VS SPECIAL PULLS: Due to shipping costs, we have to charge much more for fewer than five bits, or what we call ‘individuals'. Sets include six bits or more. Some customers will order all Jennings or all Irwin bits, or what we call, "Special Pulls". Because of the extra work, we charge and extra for these. Individual bits are $16 each ($12.80 to apprentices) This price drops to $9 per bit ($7.20) for sets. For Special Pulls, add $1 per bit. 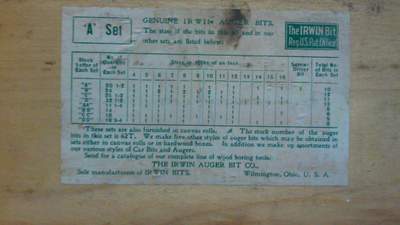 We post the picture of a sticker found on many old Irwin bit boxes. This was developed to offer professionals sets suited to their needs. This sticker is still valid now. Even though this is strictly meant as a guideline, most apprentices either order a "D" set or "BB" set.